Porto Carras Grand Resort an the organizing committee of XTERRA Greece, are pleased to announce the 4th Porto Carras Spring Half Marathon powered by XTERRA. The Porto Carras Half Marathon on Saturday 2nd and the Porto Carras Swim Challenge on Sunday 3rd of September 2017, on the resort’s magnificent 17,000 acre landscape surrounded by natural pine forests and spectacular views of Toronaios Gulf. Welcome to the Porto Carras Half Marathon by XTERRA, one of the most exciting running events taking place in Greece. Runners can enjoy a beautiful route along on the resort’s magnificent 17,000 acre landscape surrounded by natural pine forests and spectacular views of Toronaios Gulf. The open water swim race includes three distances, 5000m, 2500m and 1000m, giving the opportunity to athletes of all ages and categories to test their abilities, have fun and enjoy their participation in a well organized and safe event of XTERRA Greece. Because is a unique opportunity to visit Sithonia and to run in Porto Carras Grand Resort's lanscape. Participation can be obtained via online registration. The courses are without any serious difficulties and follows paths and trails of the magnificent pine forest. Athletes will enjoy great views of the private coves of the Porto Carras Grand Resort and the Gulf of Toronaios. The resort is surrounded by the rising slopes of Mt. Meliton and the expansive blue of Toroneos Gulf, amidst 1,763 hectares of enchantingly verdant landscape and along 9 km of sandy beach punctuated by 25 pristine coves.The athletes will end the race at the evening below the majestic colors of the marina of Porto Carras. The Simple offer is addressed to those who wish to come and stay in Porto Carras Grand Resort on their own. It includes all the logistics of the race entry, pasta party, tips and advice for the specific race, and safe keeping of your belongings during the race. This offer is ideal for those who want to experience Greece the "running way", and get the most out of their visit in Chalkidiki. We have selected the ideal locations for you, and we will suggest you the ideal vacation plan. 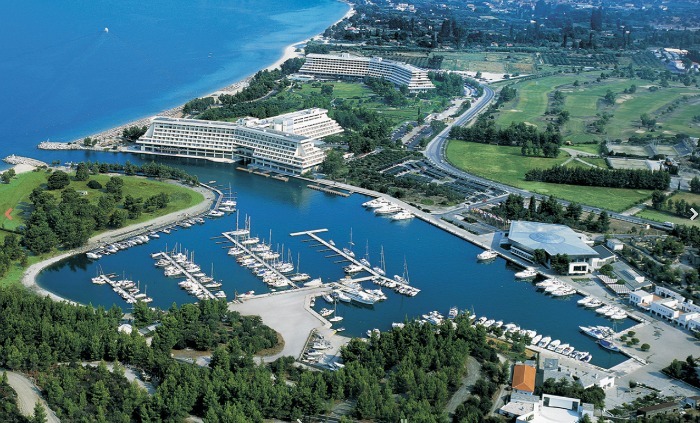 It includes the round trip from your hotel to starting line and the hotel arrangements in Chalkidiki. It also includes your registration to the race and all the logistics of the race entry, pasta party, transportation to and from the starting line, tips and advice for the specific race, safe keeping of your belongings during the race, a suggested vacation plan for all the days that you will be in Chalkidiki, and many more! It starts from €150 per person (runner or not) for a three days/two-nights accommodation in a 4star hotel. Please tell us all your requirements and preferences, how many days you want to spend in Greece, what other places you wish to visit and we will come back with a tailor-made offer specific for you! We can add trainings, running tours, car/bike rental, excursions, family activities and many more. We can also schedule other activities like Golf, Surfing, Biking, Trekking and Fishing in the nearby area. In any case our offer will include the hotel arrangements, transportation to and from your hotel, participation to the race and all the logistics of the race entry, pasta party, transportation to and from the starting line, tips and advice for the specific race, training schedule depending on your personal targets, safe keeping of your belongings during the race and a suggested vacation plan for all the days that you will be in Chalkidiki. If you are a group of people, please tell us all your requirements, how many of you are running, what you like and what you do not like and we will come back with a tailor-made offer specific for you and your company! We can add trainings, running tours, car/bike rental, excursions, family activities and many more. In any case our offer will include the hotel arrangements, transportation to and from your hotel, participation to the race and all the logistics of the race entry, pasta party, transportation to and from the starting line, tips and advice for the specific race, training schedule depending on your personal targets, safe keeping of your belongings during the race and a suggested vacation plan for all the days that you will be in Chalkidiki. There is a wide range of places tourists can choose for their base, campgrounds as well, and all of them are enchanting in their own way. Whether you visit Neos Marmaras, Agios Nikolaos, Vourvourou, Metamorphossi or any other resort or village, you’re sure to be enthusiastic with its architecture and atmosphere. Among the most interesting places to visit on Sithonia is the village Parthenonas. Situated on the slopes of Mount Itamos, it features stone houses, likable taverns, a museum, sea view and especially beautiful sunsets. A perfect stop for mountain hikers. Porto Koufo village is a place for a memorable gourmet experience. Located around 25 kilometers from Neos Marmaras to the south, it’s where you can dine just caught fish in its taverns. Moving further gets you into a splendid natural environment where the greenery and the turquoise sea blend perfectly into one another. The amazing unity is enriched by numerous small secluded golden beaches that are surrounded by trees and other vegetation. It isn’t impossible to find a beach only for yourselves on Sithonia. Seek out the Orange Beach and Kavourotypes, which are among the most beautiful. Small harbors and fishermen’s hamlets add to the peninsula’s endless charm. Deep forests alternate with olive plantations and picturesque meadows, making Sithonia one of the most beautiful natural reserves in Greece and wider. The amateur sportsmen who happen to be fans of a beautiful seaside should head to Vourvourou. Through kayaking, diving or boat rental you can explore nine islands and rich underwater wildlife, with nearby mountain overwhelmed with thick forest as a background.